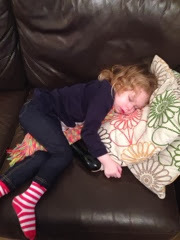 Since starting preschool it seems my girl can't stay awake but refuses to sleep for a nap at a reasonable time! For a while before Christmas she was dropping her nap three times a week at least and making it through to bedtime in a reasonably good natured mood. For the last three weeks she gets to about 3.30pm before she just shuts down. Literally she can be talking to me and fall asleep and snore mid conversation. I've tried everything to keep her awake and then when I've given her a small sleep the backlash I've faced afterwards is horrendous. It makes me cry as well because she is awful to be around, I can't settle her when she wakes and it turns from gentle crying into one almighty tantrum screamfest. I've resorted to making sure we are out and driving around at 2pm so that she has a reasonably early sleep. So far this week it's worked and she has dropped off to sleep and then I carry her in doors and put her on the sofa for a while, as my poor hormones can't take the strain of all this turmoil. She has had a cold so I'm hoping that once better she may be able to go back to a full day awake - it's funny, when she started to drop her nap I was exhausted and just wished she'd sleep so I could have a bit of brain space but now I'd rather she stay awake all day and I don't get a minutes peace. At bedtime it's all a bit touch and go, we've had to sit in her room until she falls asleep as it seems to happen quicker than if we leave her. This isn't something I'm keen to carry on as I'm used to a tired girl who is asleep, alone within five minutes of going to bed. This week she has also woken in the night and I'm not sure if she has woken herself by coughing or she is now getting too much sleep. It takes her about 25 minutes to get back to sleep in the night and she is waking between 2.30am and 3.30am. Luckily for me, Hubby has been getting up for this one because I'm unable to haul myself out of bed and to sit in her room at that time of the morning. 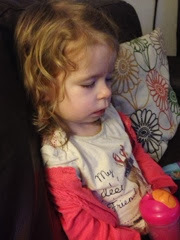 I thought (naively) that a nearly three year old sleeps all night, every night...help!